Derting has an amazing ability to make each story unique and yet tie together perfectly. The Body Finder, Desires of the Dead and The Last Echo are all individual books that bleed together to create an amazingly suspenseful story that kept me turning page after page. Violet has discovered a group of people with unique abilities and she doesn’t feel so strange when she’s around them. Soon, that side of her starts to take over and her old friendships and life begin to suffer. She’s struggling to find the balance between her paranormal abilities and being a regular teen. Derting doesn’t gloss over this struggle, but uses Violet’s friendships as a way to highlight the two halves of Violet. The one tie between everything is still Jay, the best friend turned boyfriend who keeps her centered in reality. 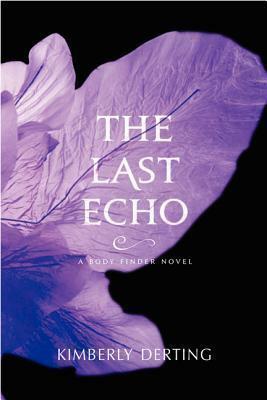 The Last Echo goes back to the serial killer idea, but there’s something especially creepy about this novel. The glimpses into the mind of the killer are chilling and disturbing and I couldn’t get enough of them. Violet doesn’t mean to enter the killer’s radar, but once she does, you know it can’t end well. Each novel has been building on the deaths of the previous novels, with Violet learning more about herself and her ability each time. She’s tired of relying on others to save her, so when she’s faced with evil and she’s the only one who can fight; she must step up and take control. I’m glad Derting waited until this novel to have Violet find herself. It felt real and I could tell the slow build is exactly what Violet needed to find her strength. I’m extremely interested to see how Derting handles the relationships going into the final novel. Violet’s friendships with her “normal” friends are starting to suffer and the relationships she’s formed with the teens like her take a hit as well. There’s a not-really-a-love triangle that Violet needs to deal with along with her relationship with Jay. She has to deal with a shift in the family dynamic as her parents start to take more control over her life, creating conflict between what Violet feels is right and what her parents feel is safe. The Last Echo had me on the edge of my seat the entire time I was reading. The mind of the killer is just insane enough to be chilling and knowing that Violet will somehow end up tangled with him had me frantically reading. The build-up from the previous two novels is starting to peak and the set-up for the final novel gave me chills. Derting is proving to be an amazing paranormal series author, finding just the right balance between the normal and the paranormal. The Last Echo makes the Body Finder series a must read and I can’t wait to see how this series is wrapped up. If this book is any indication, it’s going to be a fantastic ride. This entry was posted in Contemporary, Mystery, Thriller, and Suspence, Something a Little Different, The Must Reads, Young (and New) Adult and tagged Fantasy, Kimberly Derting, Must Read Series, Mystery/Thriller, Paranormal, Supernatural, Suspense, Young Adult.